Hi, this is part 2 of my project: STAR LOVE. Episode X: Together forever. 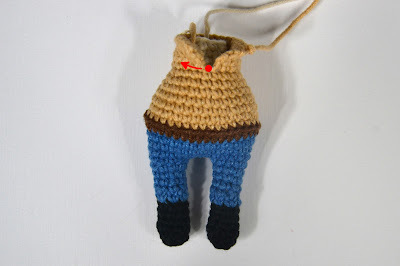 In part 2 I give you FREE pattern for Han Solo. To familiarize with the project, watch my video on YouTube. Link is below. Have a great crocheting time and subscribe my blog & YouTube channel! 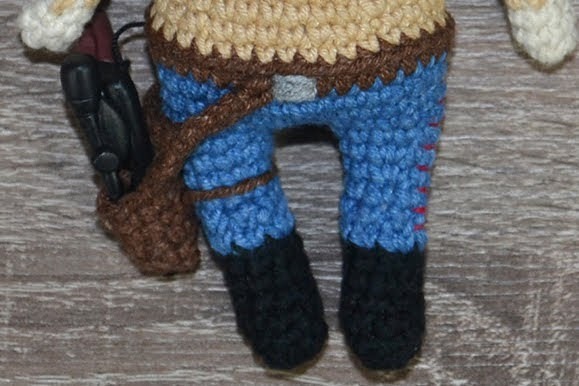 As a reminder: for crochet couple I mostly used YarnArt Jeans and crochet hook 2 mm (only for Han Solo's hair I used 2.5 mm). With these materials dolls are 15 cm tall. I crochet from legs to the body, head is made separately. When I change yarn colors between rounds, I work invisible finish to make color changes less visible. One skein of each yarn color is enough for the project. Pattern for Han Solo's legs and body is similar to Leia's but includes some color modifications. In rnd 3 there is front part of shoes, where you have pattern (dec, 1 sc, dec) and the back part (3 sc). Increases in rnd 7 and decreases in rnd 8 indicate knees. Now cut the yarn and crochet LEG II in the same way, but then don't cut the yarn, because we'll join both legs. 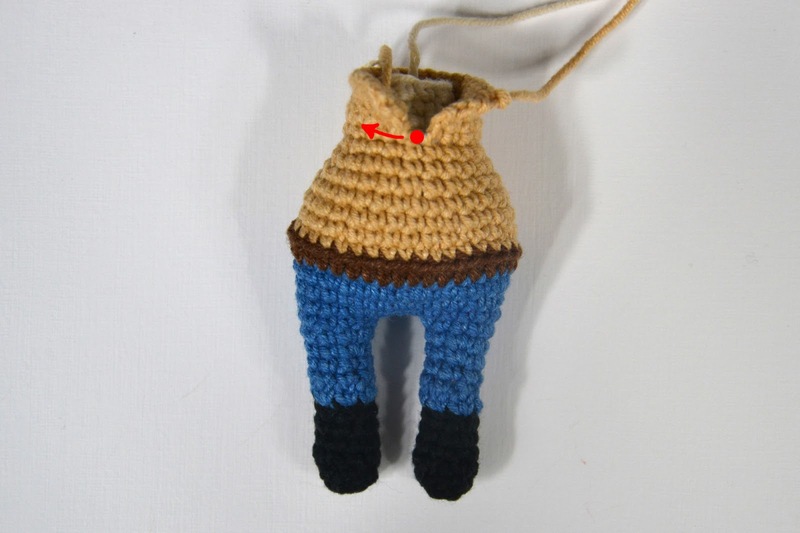 Continue with blue jeans yarn. In brackets there is number of leg. 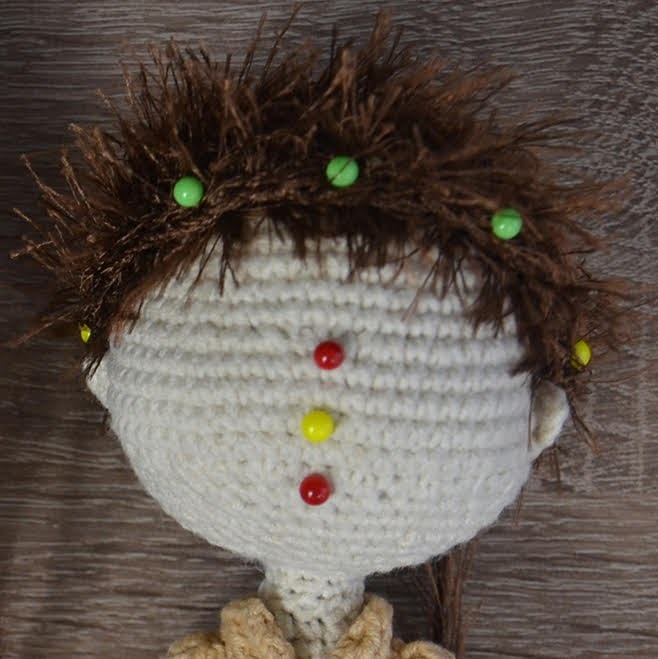 To stabilize the head I used a piece of wire 2.5 mm in diameter and 20 cm long for each doll. I bent the wire in half, shaped two loops (see the photos below), wrapped the ends with electrical tape and put into the head. Then I put the head with the wire into the body. From rounds 13 to 18 you will crochet cheeks (increases / decreases), so between these rounds keep marker straight, at the back of head. If it twists, work shift stitches. Add stuffing. Insert the wire and crochet next rounds arounds the wire inside the head. Add stuffing after inserting the wire to shape the head. 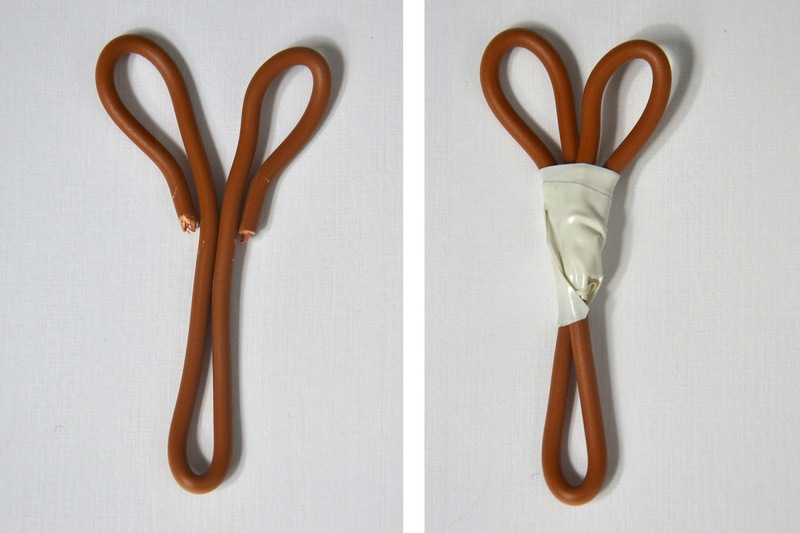 Fasten off, leave a tail for sewing head to the body. I didn't stuff the arms because they are stiff enough. Crochet the 2nd ear on the opposite side and then, after crocheting ears, try the hair, pin them to the head and sew. Firstly mark symmetry line - red head of a pin in the picture in rnd 13 between cheeks (between 2 dec) and rnd 18 (between 2 sc). When you mark the symmetry line and nose it is also helpful to find proper place for eyes. Embroider nose in rnd 16 (yellow head of a pin). Eyes are embroidered with thin thread. Below I describe you eyes for Leia. Woman eyes are wider than the man eyes. 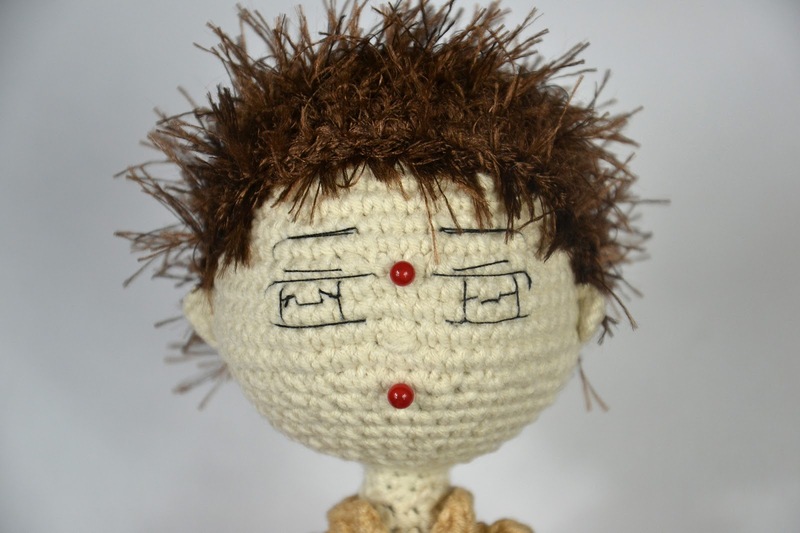 Then I tried to transfer them onto crochet face. Firstly I made outline with black thread. Red pin indicates the symmetry line (I mention it in the NOSE section above). Then I filled following colors: black - olive green (iris) - white and finally - outlines with black thread and reflexion. 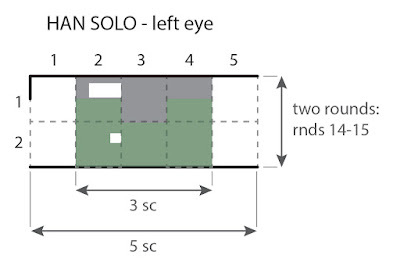 Skip 3 st (3 red dots on the scheme above) from PART I and work PART II (the back part) consisted of 10 sts. Skip 3 st from PART II and work PART III (the same pattern as PART I). Weave in loose ends as you go. Continue working scs around the vest to smooth the vest edges (if you wish). 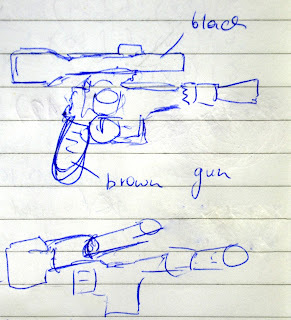 Perhaps it would be more convenient for you to make blaster first and adjust the holster to the blaster, so read BLASTER section first (below BLASTER BELT HOLSTER section). Work chains enough to attach the belt to the waist at the back (I work ch 4) and then attach it with 1 sl st, hooking through the stitches of brown belt in rnd 16 (look at the photo below). 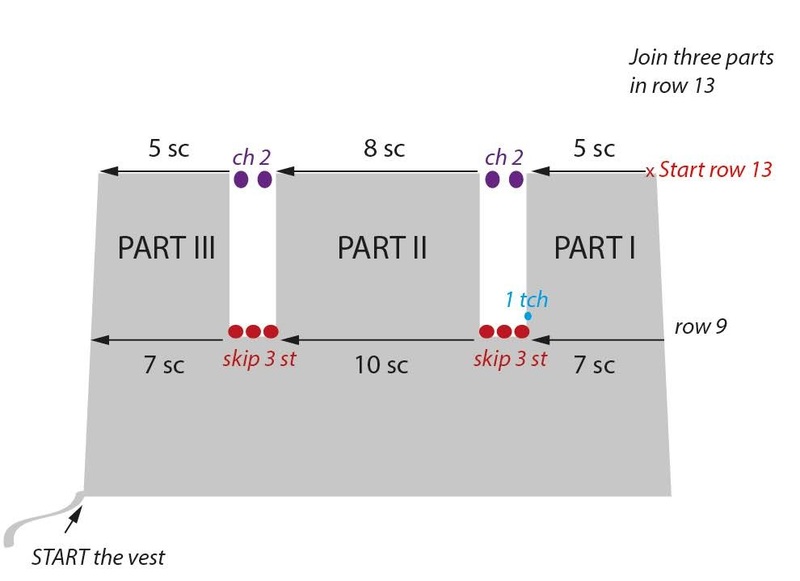 Come back along the ch 4 (work 4 sc) and then along the top part of holster (work 6 sc) and then on the other side work ch 4, attach to the clasp (in the front centre part of the belt) with 1 sl st, then come back along the chain (4 sc). Attach a piece of yarn around the thigh to secure the holster, embroider clasp with grey yarn and red stripes on the both sides of pants. Then I shaped particular elements of blaster (the size of blaster should be adjusted to the holster) and baked the clay in the oven. When the clay get cold, I tried the blaster. 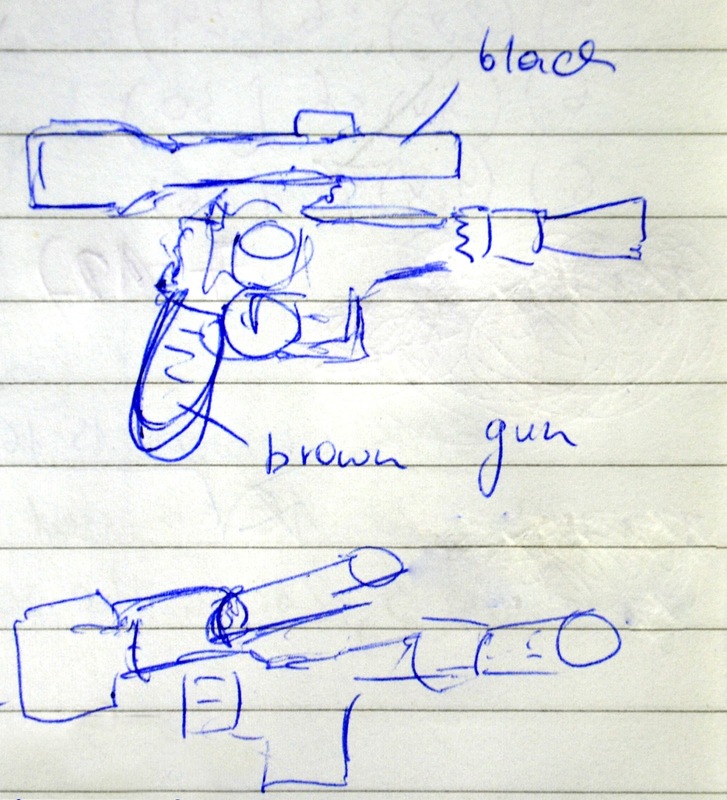 In my project blaster didn't fit the holster initially but I broaden it a bit using pencil and it was OK. Finally I attached the gun with black floss to the belt. Immodestly tell you, I love Leia & Han! Cause only I and my husband know, how much time I spent on that STAR LOVE project, especially eyes... The project was really nice challenge for me. I love anime-style look, so I hope I will manage to do more dolls in this way ;-) That was the first one. Try the pattern and if something is unclear, please let me know. Subscribe my channel and blog, visit Facebook and have a great crocheting time! I put lots of effort to create the projects, write down the patterns and make tutorials. If you use my patterns, please attach info about the source - link to my YouTube or blog.